The BIOARRAY™ Low Input RNA Amplification with Biotin Labeling System provides an optimized protocol and reagents for the production of biotin-labeled antisense RNA (aRNA) from total cellular RNA samples in less than 24 hours for array analysis. This kit has been improved to yield sufficient aRNA quantity for most microarray platforms (10 µg minimum) with total RNA input of as low as 20 ng and up to 500 ng. Entire amplification reaction can be performed in a single tube and the biotin-labeled aRNA can be purified using either magnetic beads or purification columns. The BIOARRAY™ Low Input aRNA Amplification and Biotin Labeling System has been optimized for superior performance with reduced variability and improved reproducibility and data quality. The complete system is composed of reagents for cDNA synthesis and in vitro transcript labeling. Figure 1: Quality assessment of aRNA obtained using BIOARRAY™ Low Input RNA Amplification and Biotin Labeling System. 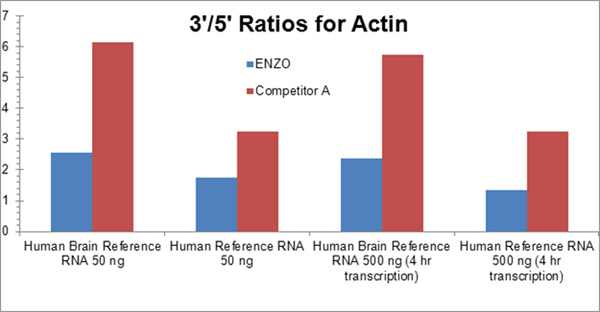 The 3’/5’ ratios, on an Affymetrix U133a array, for housekeeping gene Actin obtained using Enzo kit are much lower than the ones from the competitor’s indicating higher quality of aRNA obtained using Enzo kit. 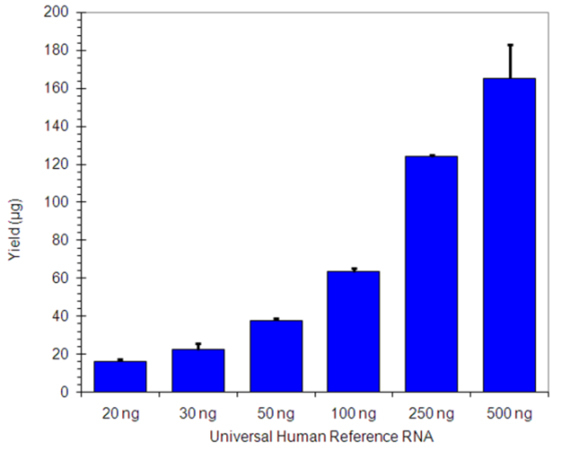 Figure 2: Universal Human Reference RNA ranging from 20 ng to 500 ng was amplified in triplicate using BIOARRAY™ Low Input RNA Amplification and Biotin Labeling System. The lowest amount of input (20 ng) generated enough labeled aRNA for Microarray Analysis. Application Notes: The BIOARRAY™ Low Input RNA Amplification with Biotin Labeling System provides an optimized protocol and reagents for the production of biotin-labeled antisense RNA (aRNA) from total cellular RNA samples in less than 24 hours for gene expression analysis. Use/Stability: Store at -20˚C in a non-frost free freezer. Technical Info/Product Notes: This product is manufactured and sold by ENZO LIFE SCIENCES, INC. for research use only by the end-user in the research market and is not intended for diagnostic or therapeutic use. Purchase does not include any right or license to use, develop or otherwise exploit this product commercially. Any commercial use, development or exploitation of this product or development using this product without the express prior written authorization of ENZO LIFE SCIENCES, INC. is strictly prohibited. Enzo and BIOARRAY are trademarks of Enzo Life Sciences, Inc. Several of Enzo’s products and product applications are covered by US and foreign patents and patents pending.